Fancy some free spins? 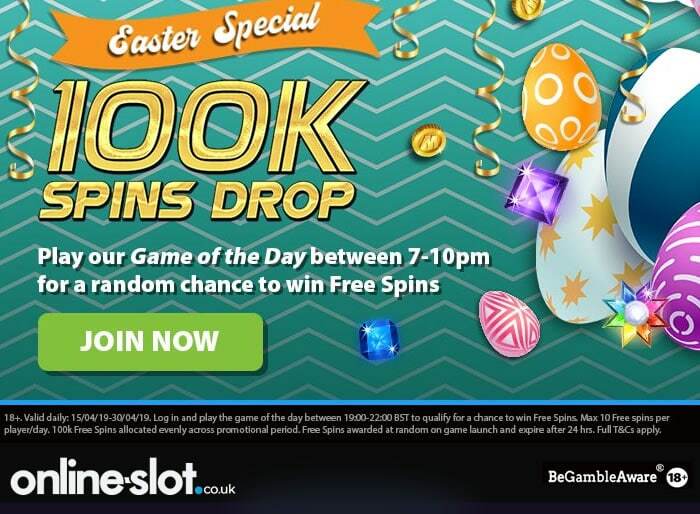 bgo Casino has 100,000 of them to give away in their Easter Special Spins Drop which runs from today until Tuesday the 30th of April (2019). To be in with a chance of winning a shar. just get spinning on Game of the Day between 7pm and 10pm UK time. Each randomly chosen winner will receive 10 free spins to be used on the Game of the Day. You’ll have 24 hours to use those free spins which don’t come with any wagering requirements. Anything you win is yours to keep. Here’s what the line-up of qualifying slots looks like. Kicking things off today is Temple of Treasure MegaWays. Created by Blueprint Gaming, it’s a 6 reel slot that’s played using the MegaWays game engine where the number of symbols on each reel changes with each spin. If they reach their maximum, you’ll have 117,649 ways to create a winning combination. As usual for a Blueprint Gaming slot, the sound and visuals in Temple of Treasure are very good. The action takes place against a jungle backdrop with the reels set within a stone temple. Keep a special eye out for the golden star symbol. When these hit, they all transform into the same matching symbol and a new payout follows. Whichever one you go for, you’ll benefit from a multiplier which increases by 1x with each winning combination. There’s no limit to how big the multiplier can get. If you like MegaWays games, then Temple of Treasure MegaWays is well worth a look as you can win 50,000 times your stake on each free spin. Take it for a spin at bgo Casino between 7pm and 10pm tonight and you could land some free spins. New players are eligible for 10 free spins just for registering at bgo Casino. Newbies can also get a 100% bonus worth up to £200 or up to 50 free spins when making their first deposit.